This recipe is special to me for a few reasons. The first and most special is that it comes from my dad, and it’s one of the first things I make when I’m really missing him. The next reason is that it was the subject of my very first food article. I recently wrote it as a trial article (on a whim of course! ), and was so excited and shocked when it was published. You can find the original article on DcFüd.com. Check out the blog while you’re at it; it’s full of great articles and recipes, as well as product and restaurant reviews, and info on events in the DC/MD/NOVA area. And finally, although it comes from my dad, I have fiddled with it to make it my own. As a result of my fiddling, I have allowed people to successfully make a recipe they had previously written off after having disastrous results. Since my original post, I have heard from several family members and friends saying they made my version, and were thrilled with the results. I love stuff like that!! Helping people enjoy the cooking and eating process is one of my favorite feelings. I’m so proud of it, I’m just going to re-post my article (plus, my dad told me I had to). I apologize to my friends and family who have already read it. But if you would just go and make it already you’d forgive me. Promise. Tuesday: I left my house at 7 am, had classes all day, a granola bar for lunch, raced off campus at 2:45 to make it to my daughter’s gymnastics class and blew in the door at 5:30 with my two hungry kids. I did not plan ahead for dinner; there was nothing happily simmering away in a crock pot on my counter. My answer, as it so often is, was pasta. 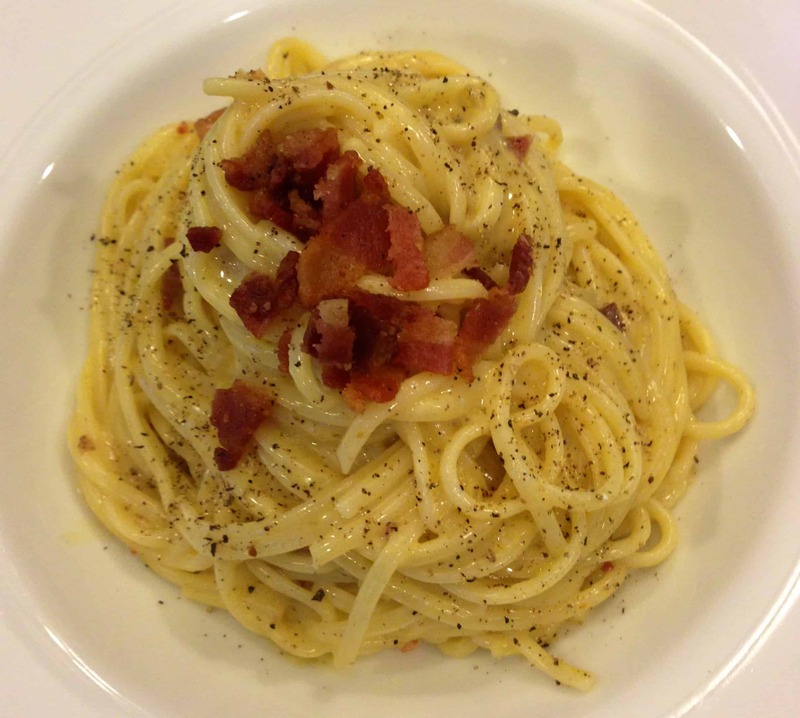 But not just any pasta… My dad’s pasta carbonara (with a few of my small tweaks). I grew up eating it, it’s not fancy, it’s not quite traditional Italian–although pretty darn close (Please excuse me for not stopping at Wegmans to buy cured pig cheeks). 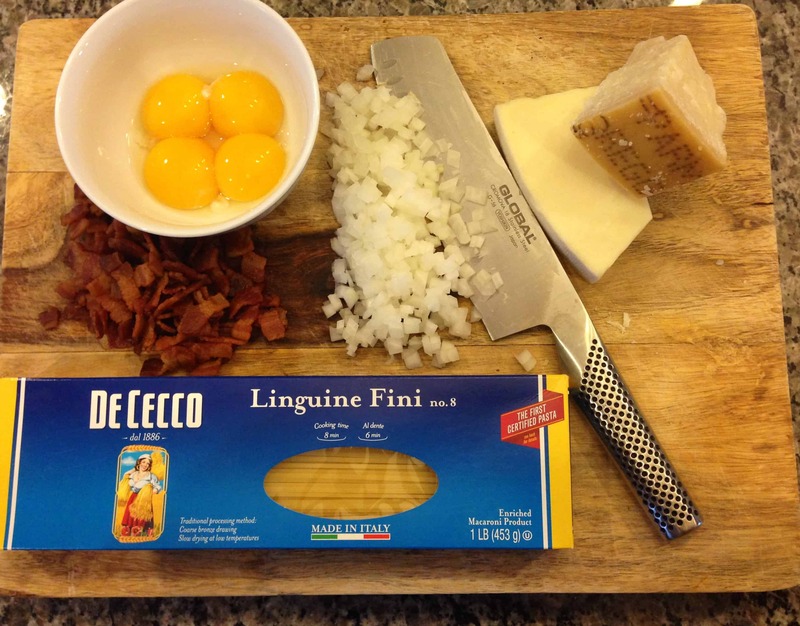 Anyhow, in the time it takes to boil the pasta, I can assemble the rest of the ingredients. It all gets tossed together and served. It really is that simple. This dish proves that comfort food doesn’t have to take all day, and that busy people don’t have to resort to take out, frozen food, or sauce from a jar. My son refers to it as “that creamy bacon pasta thing” and my daughter just likes anything involving noodles and/or bacon. It is a less than 30 minute meal that satisfies deeply and I can almost guarantee most people have the few ingredients it requires in their kitchens right now. And who doesn’t love the smell of bacon at the end of a long, crazy day? Cook’s note: Before getting started I recommend pouring yourself a cold glass of Italian Pinot Grigio. It helps make the experience more authentic… That’s my story and I’m stickin’ to it. Once boiling salt generously and cook your pasta according to the package directions. While waiting for the water to boil, begin crisping the bacon in a large skillet over medium heat stirring occasionally. When bacon is crisp, remove to paper towel lined plate to drain and pour off excess bacon drippings, leaving about 2 tablespoons in the pan along with any brown bits. Return pan to heat and add onions and garlic, cook until softened, but not brown-about 5 minutes. turn heat off and leave onion/garlic mixture to cool slightly. When your pasta is almost cooked, scoop out a cup of the water, and very, very, VERY slowly drizzle the hot water into the egg yolks while whisking constantly. If you pour the hot water in too quickly, or without whisking, you will have scrambled eggs. When your pasta is cooked, drain it in a colander or scoop directly from pot to pan with tongs, and add it to the skillet containing the onions and garlic, grind in as much black pepper as you can stand, I like about 20 grinds from my pepper mill (they don’t call it coal miner’s pasta for nothing; the black flecks are said to resemble flecks of coal). Quickly add the egg mixture, cheeses, bacon, and parsley if using and toss immediately with tongs until the mixture clings to the noodles and becomes silky. At this point the hot pasta will cook the eggs, but not curdle them, so it is very important to add the egg mixture to the noodles as soon as they come out of the water. Let this sit briefly, one or two minutes, and stir once again before serving.